Chart Wealth... Morgan Stanley Commodity Index Cycles Forward! July 2006, Volume 3 Issue 5 Know It - Profit! "AMEX Morgan Stanley Commodity Index Cycles Into Action!" Welcome to the inaugural quarterly issue of Chart Wealth. I've been busy putting together some great content and needed to free-up some time to do it. Therefore, I cut back to a quarterly schedule to accomodate my schedule. Meanwhile... the markets have taken a drubbing this last quarter. Were your contingency plans ready? Were any of your 10% stops hit? Did you have any stop losses in place? On a daily basis, it appeared brutal. However, from a monthly perspective it's just a meandering in an upward channel. I'm not concerned, yet. Are you? This month the AMEX Morgan Stanley Commodity Index has piqued my interest... so I'll be taking a closer look. The once stellar Russell 2000 (^RUT) has slumped 4.55% for a loss of 34.55 points for the quarter. However, it still remains in positive territory for the year with a 5.94% gain. The once lack-luster Dow Jones Industrials (^DJI) has remained essentially even, eking-out a quarterly growth of 0.05%! For the year, the index is up a total of 2.79%. The Wilshire 5000 (^DWC) stumbled this quarter, losing 2.37%... although, it remains in the black for a yield of 1.06%. The Standard & Poor's 500 (^GSPC) is down 2.13% over the last three months... but still hanging-on for a yearly return of 0.11%. The Nasdaq Composite (^IXIC) took a major hit... down 7.01% for the quarter. It is now in the red, swooning to -3.19% loss for the year. It's no surprise the energy sectors continue to gush profits into the world market pipelines. The AMEX Oil (^XOI), AMEX Natural Gas (^XNG) and PHLX World Energy (^XWE) indices are flowing freely at 7.26%, 4.42% and 3.83% gains, respectively. Additionally, the PHLX Utility Sector (^UTY) is charging up with a 4.92% quarterly boost. Finally, the AMEX Morgan Stanley Commodity Index (^CRX) is showing some signs of life. This cyclical index is up over 3.55% for the last three months. 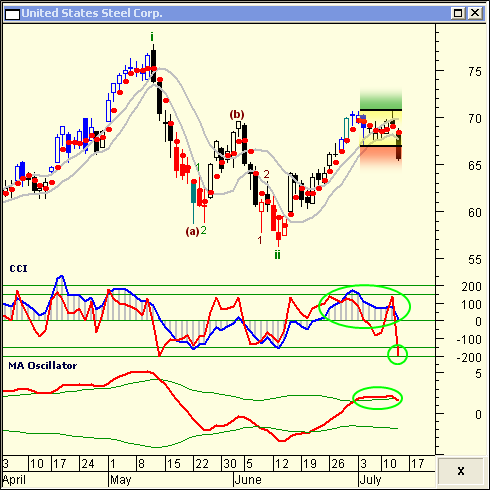 United States Steel Corp. (X) is in position to lead the AMEX Morgan Stanley Commodity Index to loftier gains. The weekly chart of X reveals the birth of a third impulse wave... typically the biggest of all impulse waves. Note how the volume tapered-off during the larger third to fourth wave decline from March to July 2005. See how the demand dried-up before the next wave began. As the next impulse wave gears-up, the strong levels of the Elliott Oscillator and increased volume are evidence the move is getting underway. Also, the stochastic RSI has turned up... predicting the start of the new third wave. Are the lofty Fibonacci targets of $95 and $135 within reach? But, the burning question is... how do I get in for big profits? The daily chart of United States Steel Corp. (X) has graciously decided to pause, letting us get aboard. The P&L Dots have consolidated at the 8-10 moving average and are remaining inside the channel... one possible entry point. But... first, let's check some other short-term indicators. 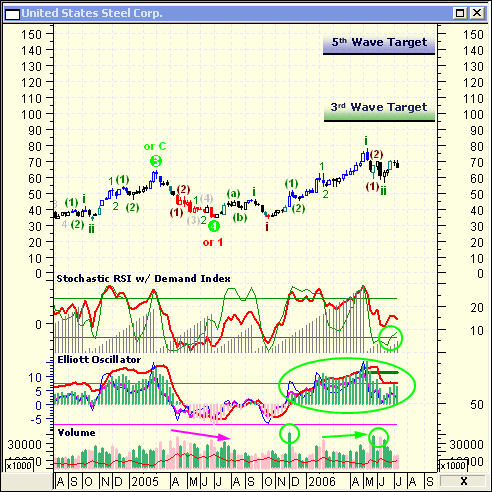 The 20-period Commodity Channel Index (CCI) is solidly bullish. Any pull-back to the zero line would be an opportunity to go long. The 6-period CCI is well extended and should reverse north rather quickly. Also, the MA Oscillator is definitely bullish... remaining at or above its upper channel. As a side note... what is the MA Oscillator, anyway? I know you've been wondering since I introduced it a few months back. Well, it was created by Mr. Kevin Spratling in the mid-1990's under the name of the Market Annihilator. Think of it as a cross between the MACD and Bollinger Bands. Typically, I don't like to use proprietary systems. But, since it works so nicely, I'm going to continue to use it. I'm trying to get Mr. Spratling to let me reveal the formula to my subscribers, only. Stay tuned! So... where do we enter this trade? I've used the colors of a traffic signal as a guide... green is go, yellow means caution and red says - no way. Although X closed in the red, the P&L Dots remain in the yellow... which is OK, for now. Bottom line... wait for a close in the green before going long. Then refer back to the weekly chart as your price target guide. Don't forget, use a 10% money management stop loss order to protect your capital. As your profits increase, move up your stop loss order, accordingly. Now... let's sit tight and make the market come to us! I hope you enjoyed this issue of Chart Wealth. It was a long time in the making. In the mean time, I need your help. Please let me know what you think about Chart Wealth and Stock-Charts-Made-Easy.com. What do you like? What can be improved? What would you like added? Is there too much advertising? Should I charge for premium content?